Last day of November! Where did all the time go? 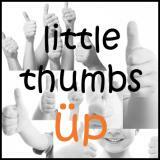 Before today ends, I better hurry blog about my oat entry for Little Thumbs Up! 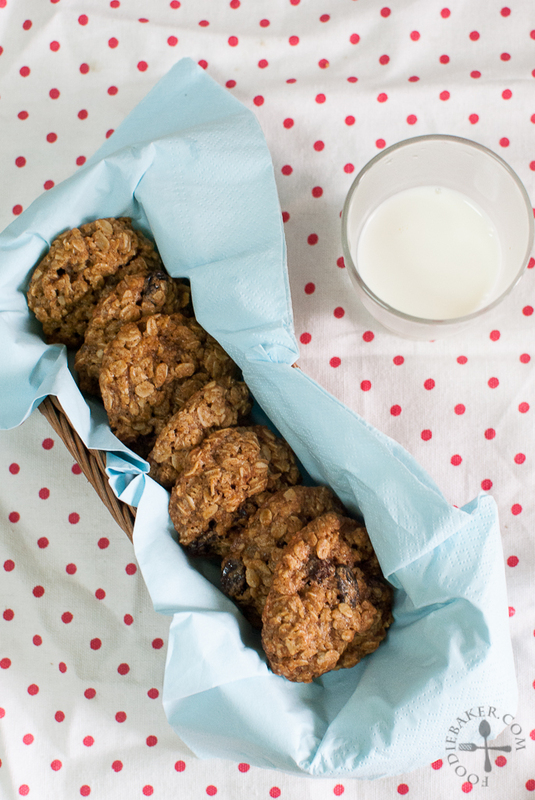 I’ve chosen a classic for my oat-themed bake – the oatmeal raisin cookies! 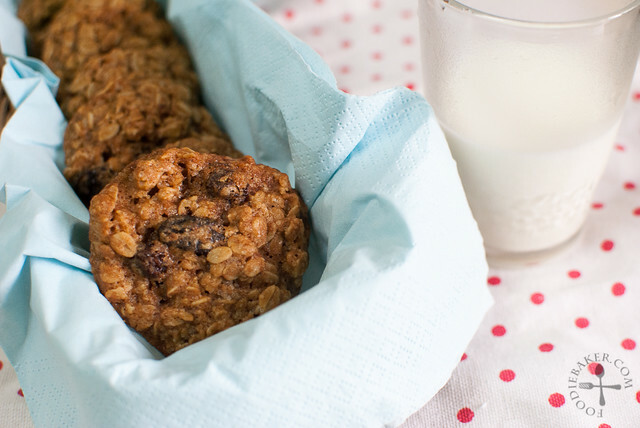 I love oatmeal cookies as they are soft, chewy and delicious. In fact, sometimes I will leave my oatmeal cookies on the table counter for them to soften even further before eating them! I got this recipe from a cooking show hosted by Anna Olsen and what I love about it is the use of dark brown sugar and cinnamon in the cookies. The dark brown sugar lends a really dark and molass-y flavour while the slight hint of spice elevate the flavours. The cinnamon is not a lot so only a few people could detect its presence. Here are the step-by-step photos! 1) Measure the dry ingredients. 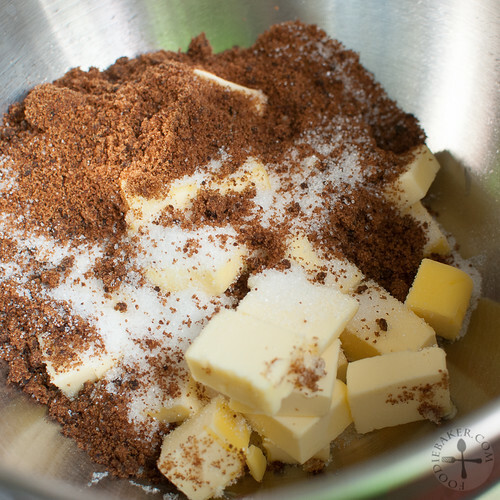 2) Cream butter and both sugars together. 3) Beat in one egg. 4) Beat in the second egg! 5) Add in the vanilla. 6) Followed by the dry ingredients. 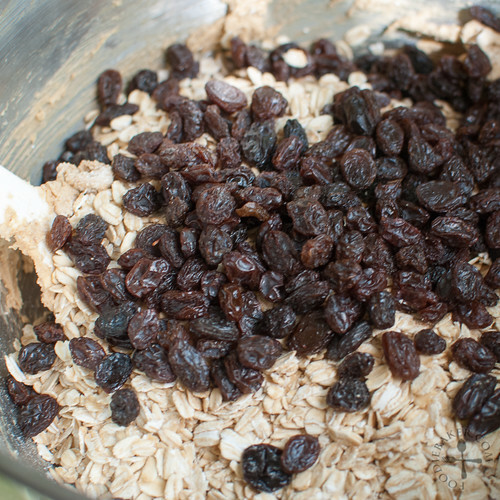 7) Lots of oatmeal and raisins go in as well. 8) Batter is ready! With a glass of milk, anyone? I’m going to submit this to Little Thumbs Up organised by Doreen from my little favourite DIY and Zoe from Bake for Happy Kids. This month’s theme is Oats – hosted by Vivian from Vivian Pang Kitchen. The recipes are all linked at this post! 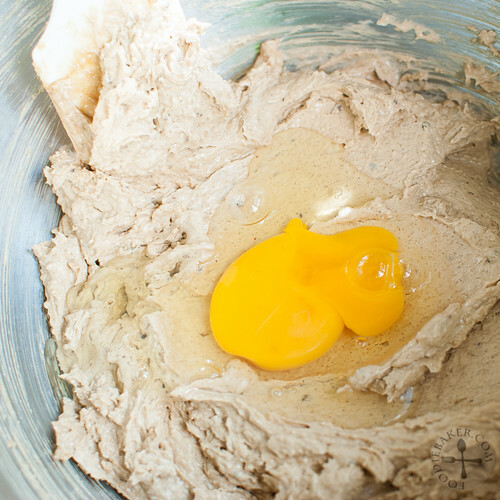 Cream butter and both sugars together in a large mixing bowl with an electric mixer on medium-high speed until light and fluffy, scrapping down the sides several times. This will take about 5 to 7 minutes. Beat in the eggs 1 at a time, beating well after each addition. Beat in the vanilla then scrape down the sides. 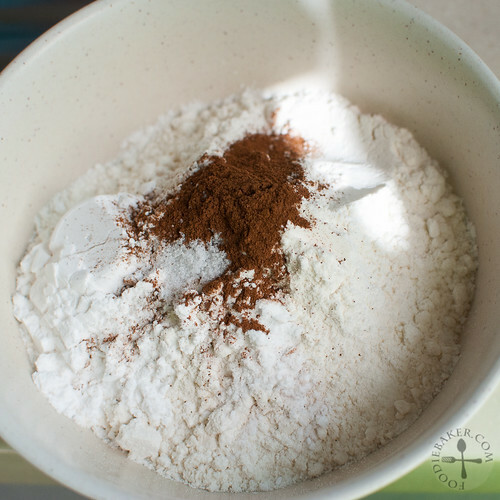 Add in flour, cornstarch, cinnamon, baking soda and salt. Mix on low speed until incorporated. 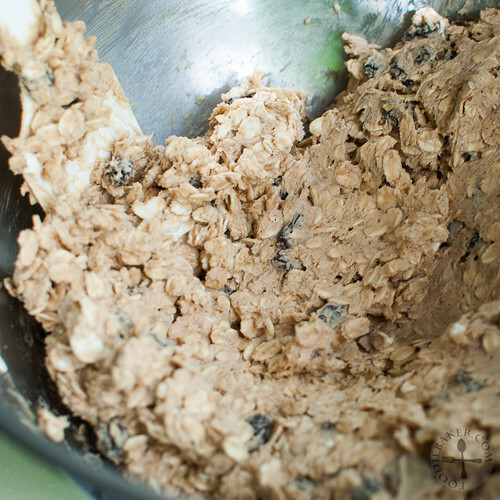 Add in oats and raisins and mix well with a rubber spatula. 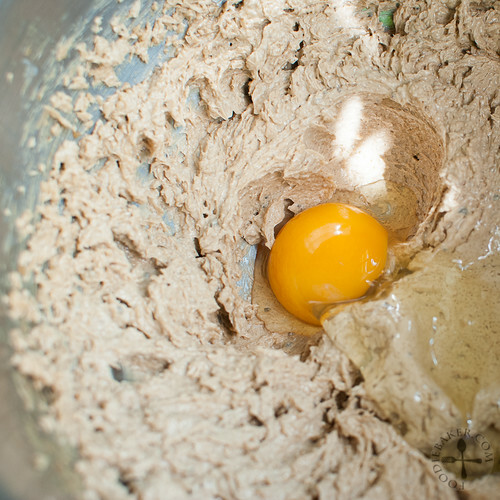 Scoop heaping tablespoons of dough and shape it into a ball. Place on a baking sheet and refrigerate for 1 hour until firm. Preheat oven to 180 degrees Celsius. Line a baking sheet with parchment paper and place the ball of dough on top, ensuring they are about 1.5-inch apart one another. Flatten the just slightly and bake for 10 to 12 minutes. Let cool completely on the wire rack and store in airtight container. The raisins lend a lot of sweetness to the cookies, so if you are intending to increase the amout of raisins, cut down sugar to balance the sweetness. 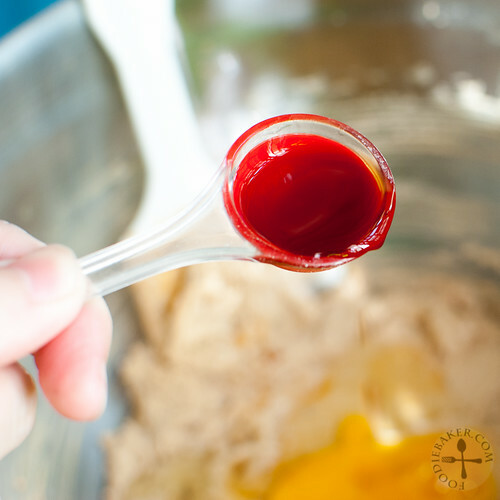 Refrigerating the dough before baking will help prevent the cookie from spreading out too much during baking. If you like very flat cookies, you can skip the refrigerating and bake straight away. 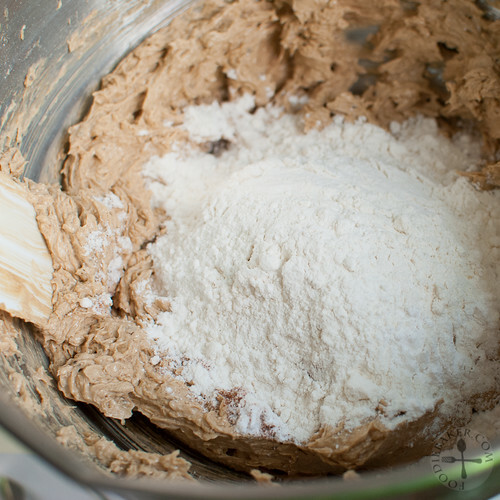 You can make the cookie dough ahead of time – after shaping the cookies, stick them into the freezer for 2 to 4 hours, then transfer them into a ziploc bag and they can last in the freezer for months. Remove them from the freezer and let thaw at room temperature for 15 to 20 minutes before baking, adding a few more minutes to the baking time. Hi Jasline, intend to bake this for CNY. Can they keep well in airtight containers for a few weeks? Hi Kimmy, I store the cookies in an airtight container (I used Tupperware) at room temperature on the table counter. I still have some leftover – for 2 weeks already and they still look and taste okay. Not sure if they can last past 3 weeks but I don’t think I want to try… think I will be finishing them all very soon, haha! Thanks Jasline for the advice. I want to bake them as CNY giveaways and hope to do it earlier. Cute website – I’ve pinned it for future reference! Yummy, definitely must try making these! Thanks for sharing! 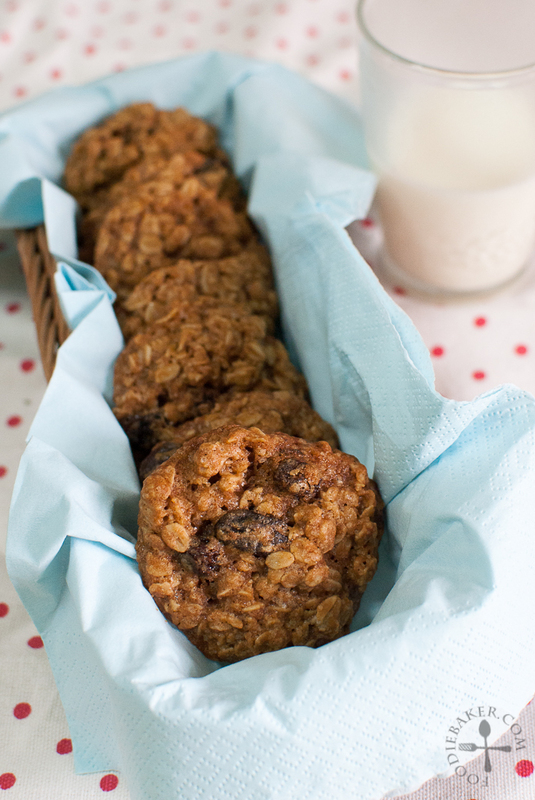 I love soft chewy oats cookies too. Those cookies are pure temptation! Before going, I have to apologize that I was unable to follow you via Google+ as I have not fully explore the options of using this social network. Oatmeal raisin cookies are the best! I know many don’t “appreciate” raisins and that’s their loss. All the more of these cookies for me! Never have made them with cinnamon, though, and I bet they’re great with it. 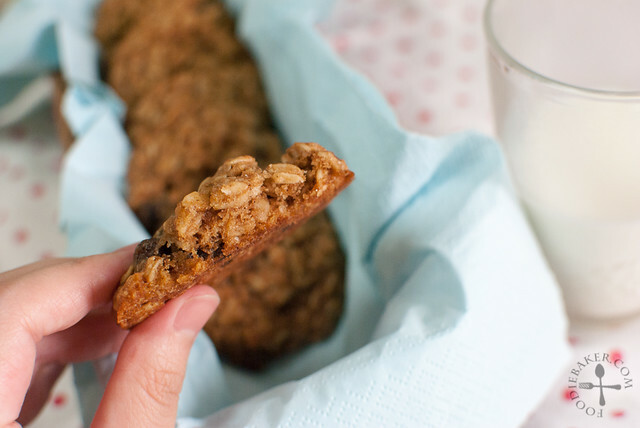 I love oats cookies too and I like mine big so 1 piece is enough…yours looks lovely and I love the addition of cinnamon to it.